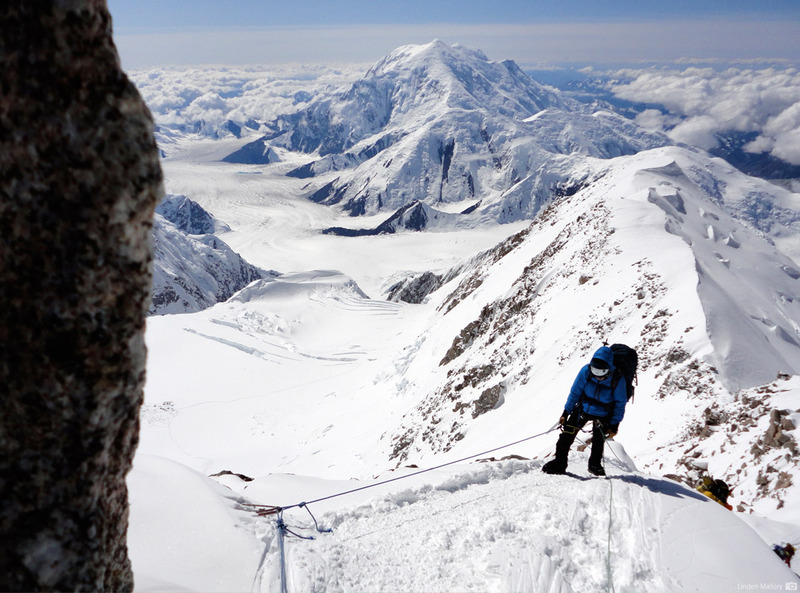 If Denali is on your climbing list, consider joining Dave for this once-in-a-lifetime experience! 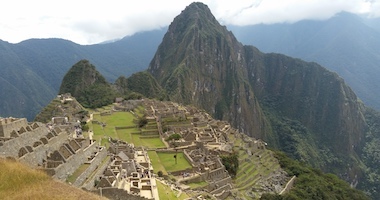 Climb with Dave Hahn and experienced RMI Guides, benefiting from the background, training, and expertise of our leaders as you venture to higher altitudes. 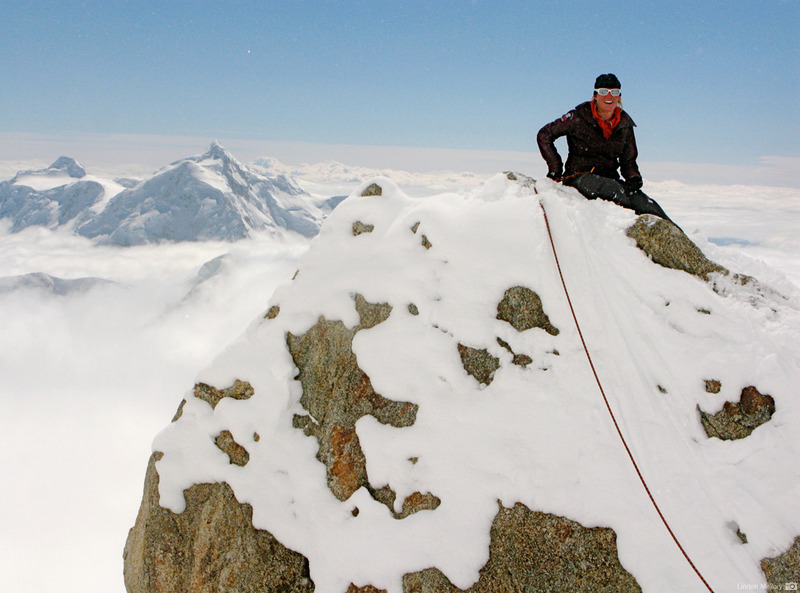 Dave Hahn is a living legend in the world of American mountaineering, with fifteen successful summits of Mt. 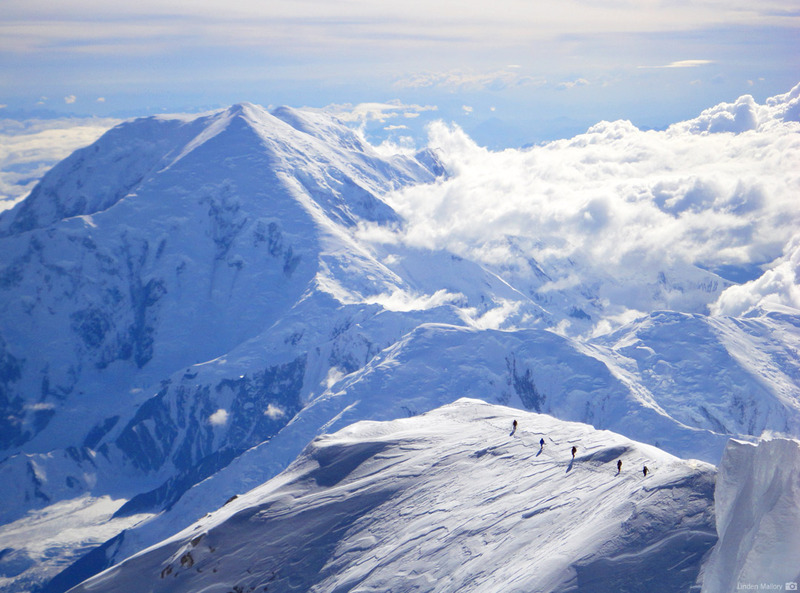 Everest, twenty-one summits of Denali, and over 275 climbs of Mt. Rainier. He also has the record holder of the most Vinson summits, finishing last season with 35 total. 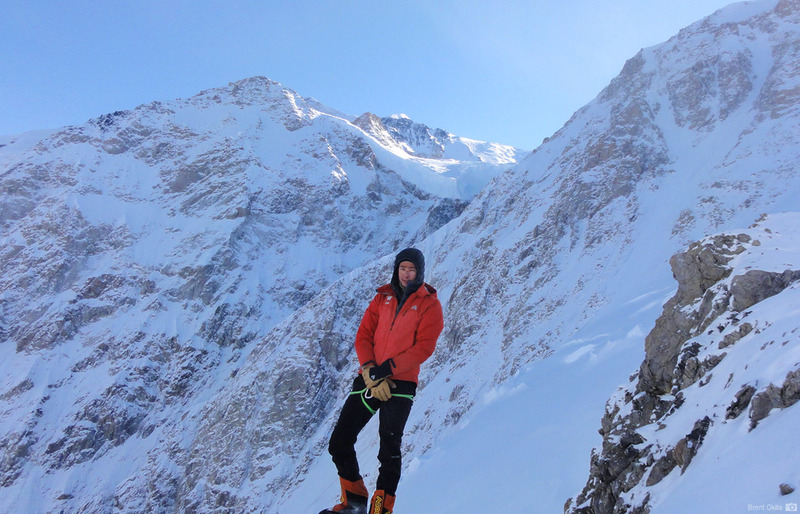 What sets him apart is a passion for mountain guiding. He is a patient, hands-on instructor who leads by example, and loves helping people attain their climbing goals. 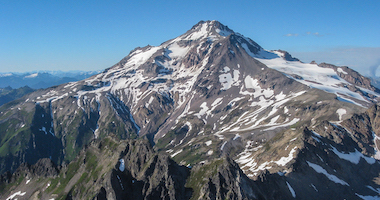 Dave will regale the party each day with stories of his limitless outdoor exploits. 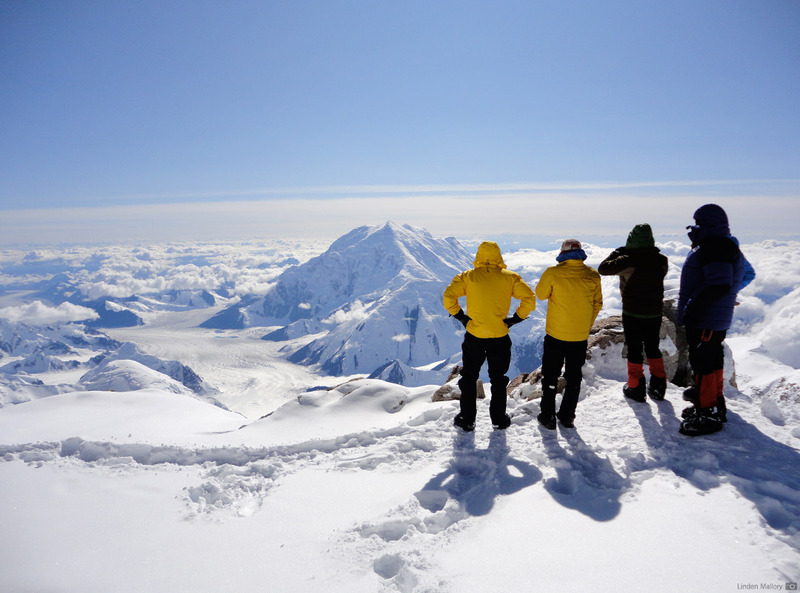 Denali expeditions have always held a special attraction for Dave. 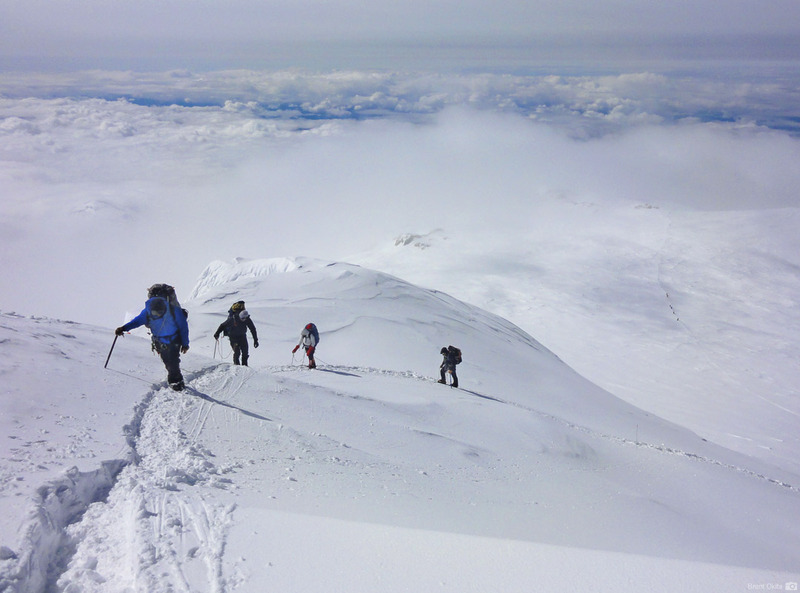 Preferring to climb late season, he has led the RMI late-June climb for years. 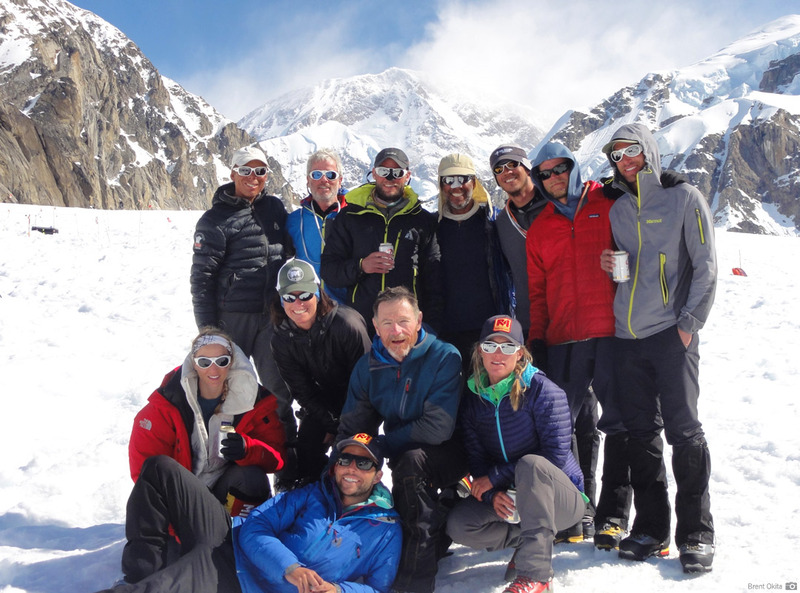 This Custom trip will maintain a 2 to 1 climber to guide ratio, with a maximum group size of eight climbers and four RMI guides which guarantees plenty of personal attention. 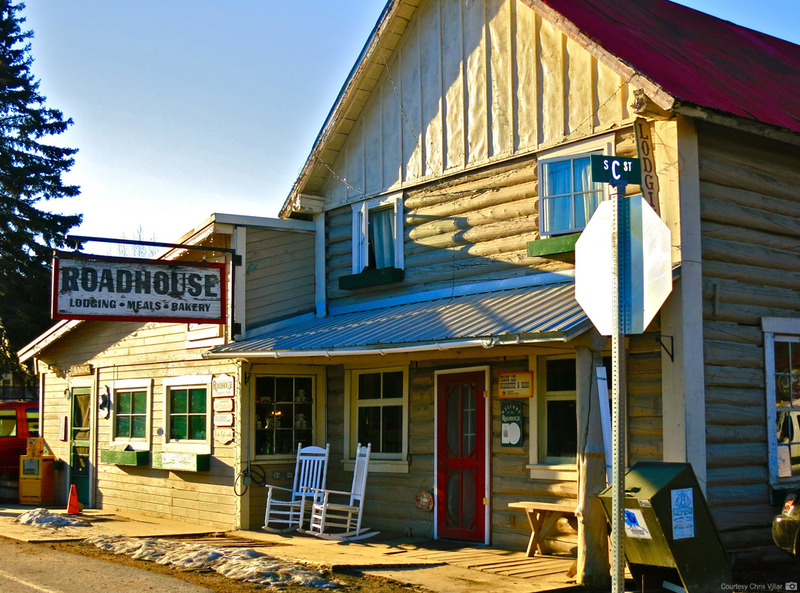 A post-summit celebration dinner in Talkeetna will be hosted for the team. The climber to guide ratio on Dave's trip is 2 to 1. 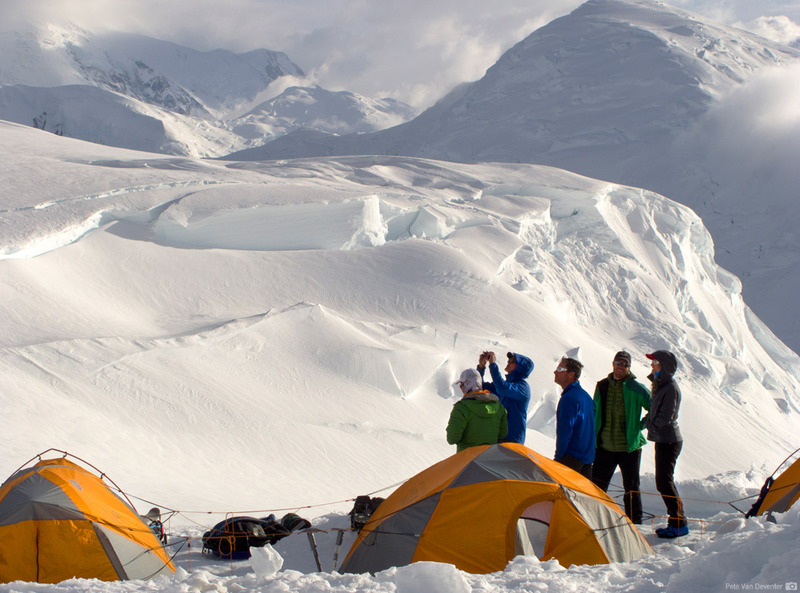 Our Denali expeditions are led by RMI’s foremost guides who bring years of climbing experience on not only Denali but on mountains all over the world, from the Andes to the Antarctic to the Himalayas. 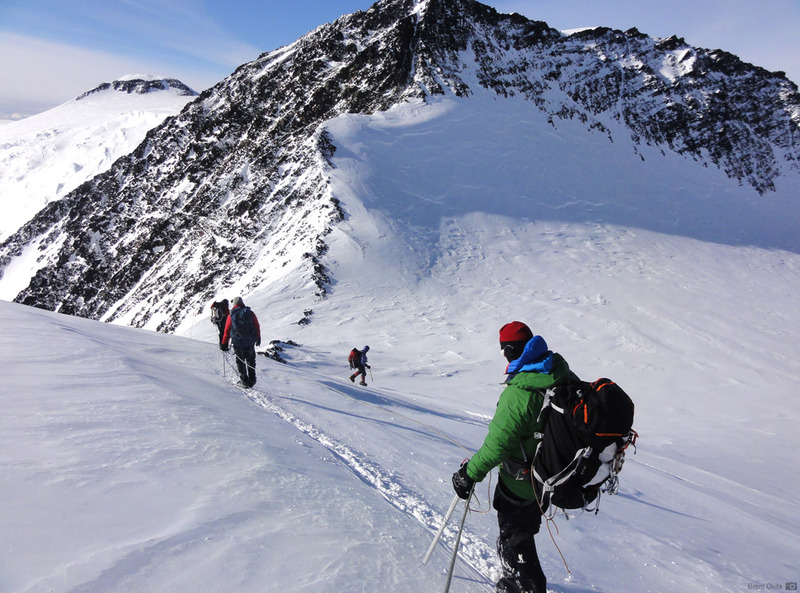 With over 35 years of accumulated knowledge guiding Denali, our guides are second to none. 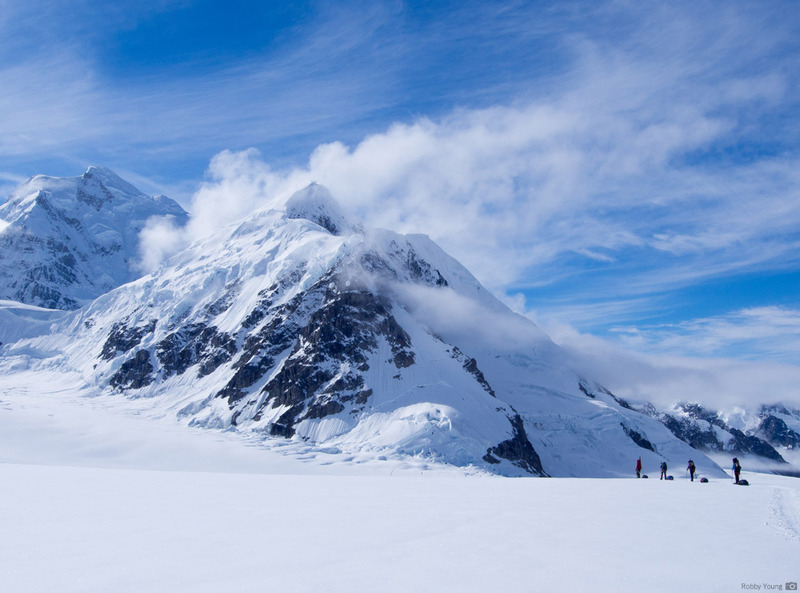 Our guides closely monitor climbers’ performance and acclimatization throughout the team’s ascent and will make day-to-day variations in order to better your chances of reaching the summit. 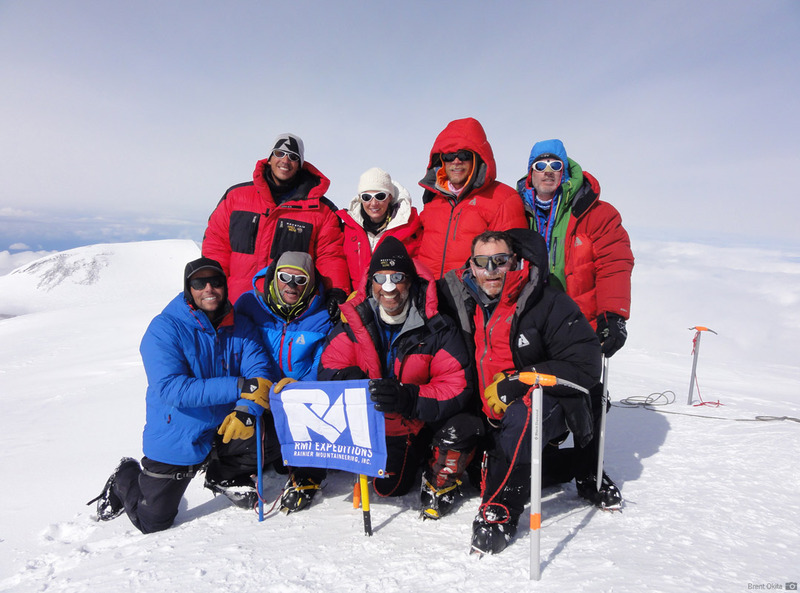 As you reach higher elevations and test the limits of your experience, the value of an accomplished, highly trained RMI Guide held to our standards cannot be understated. 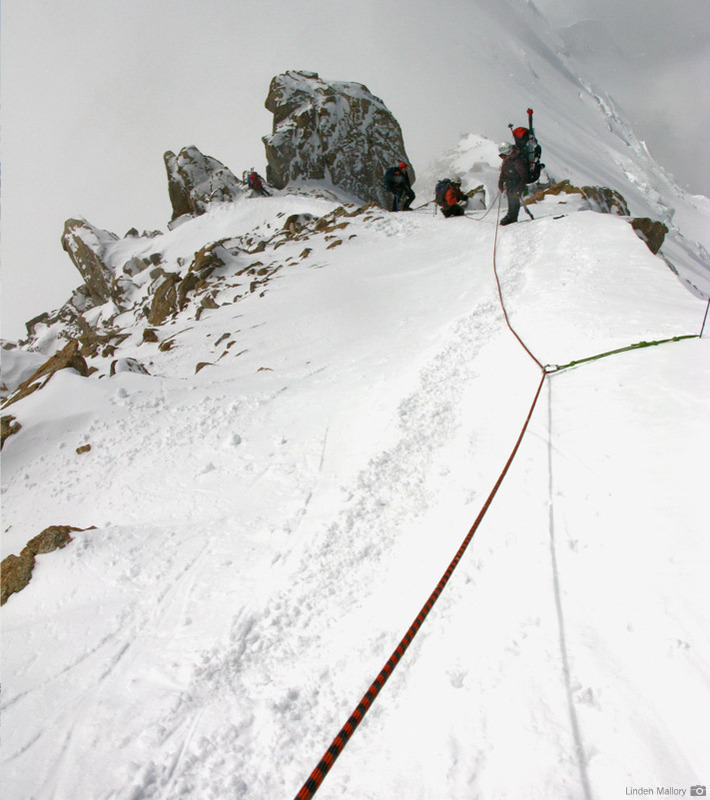 We offer private expeditions on the West Buttress and Upper West Rib routes. Please contact our office for more information. These programs require advance preparation and subject to guide availability. 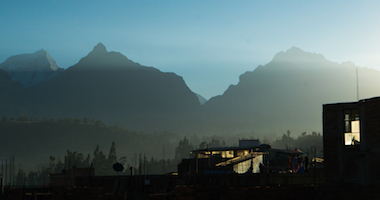 Safety has always been RMI’s top priority and we strive to create the safest mountain experience possible. 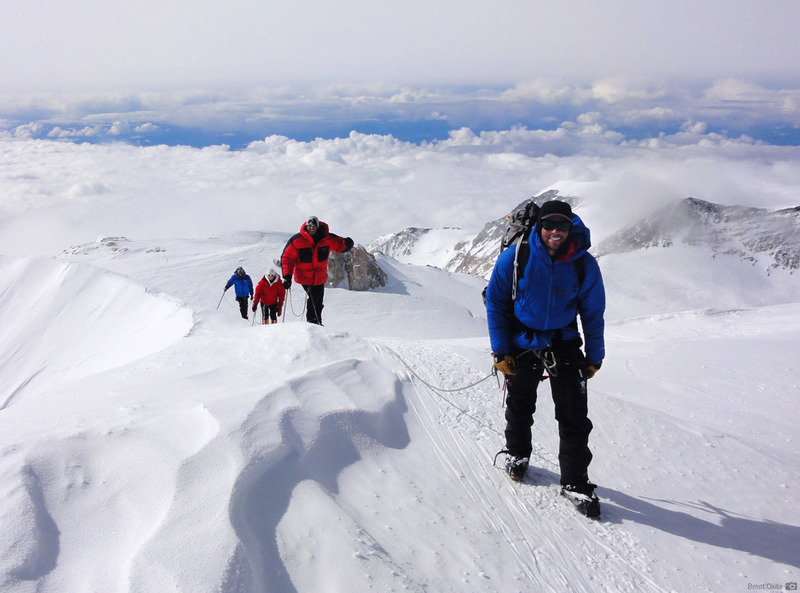 RMI’s experienced team of guides focus on leading a fun and successful climb without compromising safety. 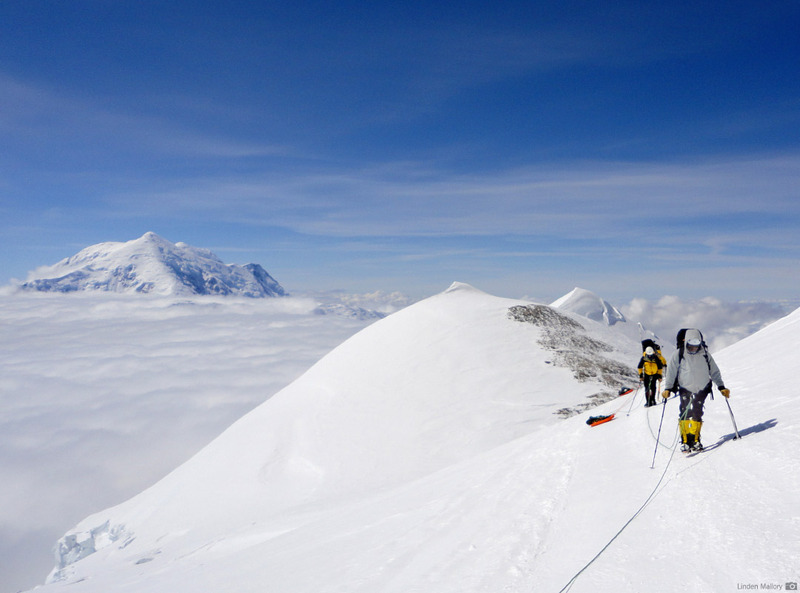 We apply the same strict standards of safety we bring to the Antarctic and the Himalayas to our climbs of Denali. Careful planning, precise ascent profiles, flexibility in our itinerary, and diligent attention is taken as we venture to high altitudes. 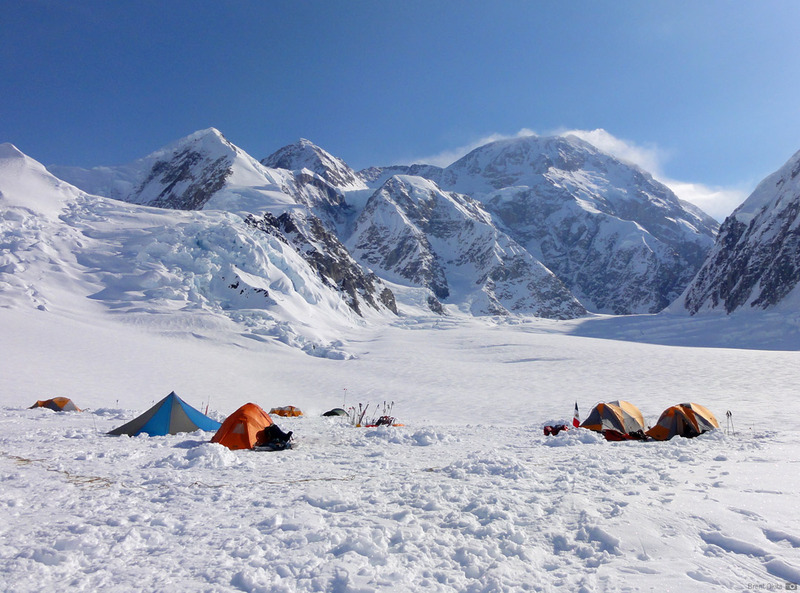 Additional resources are stationed at Base Camp and 14,000’ Camp and comprehensive medical kits, rescue equipment, and radio and satellite communication equipment are carried with the team throughout the climb. 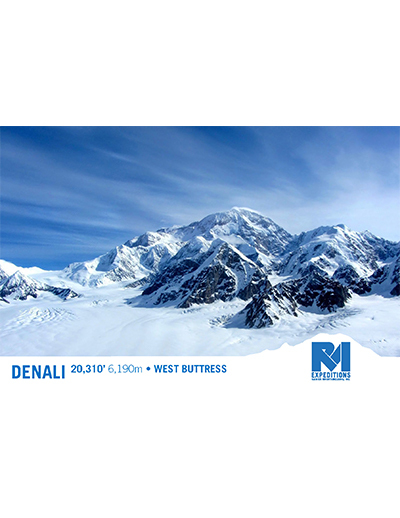 I would honestly have to say that it would be hard to improve RMI's Denali trip. It was an honor to climb with our experienced and thoughtful guides. Hearing stories from Dave Hahn is brushing shoulders with a legend, and learning from him is a incredibly special opportunity. The guides, structure, resources, knowledge, and experience provided by RMI. 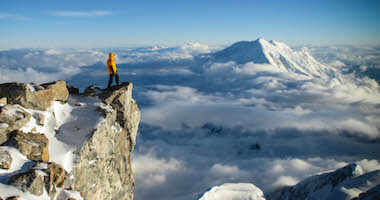 I felt safer and more prepared than anyone else on the mountain. Dave, Steve and JM earned the team's respect with their leadership ability, knowledge, and forthright demeanor. They created a relaxed atmosphere where everyone felt comfortable participating and that they were really part of a cohesive team. Well done! How Dave, Steve and JM built our confidence one day at a time and kept up our morale during storm days. We melded into a team and we were ready for the summit day when it came! The itinerary was dynamic and reasonable. We took weather and rest days as necessary. The best part was that we reached the summit -- even though it was a 14 hour day. We just kept at it (per the excellent weather) and we all made it. 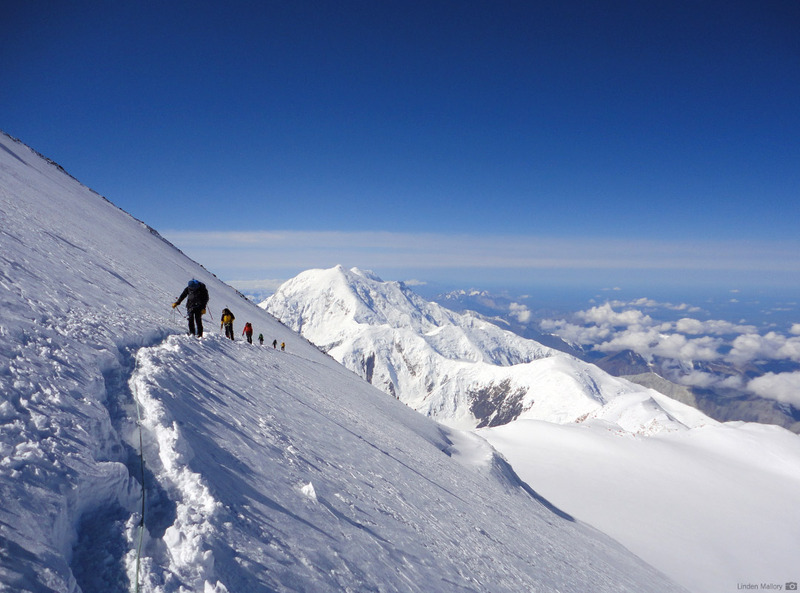 I am glad that we descended from High-camp to Camp 3 (11k) instead of parking at Camp 4. In fact, I would have been "GO" with the idea of going all the way from High-camp down to base-camp (airfield). I am glad that we had essentially good weather and were able to experience a good deal of the mountains and glaciers in terms of being able to see (and take pictures) of our general surroundings. The view down from the top of the fixed-lines was amazing. 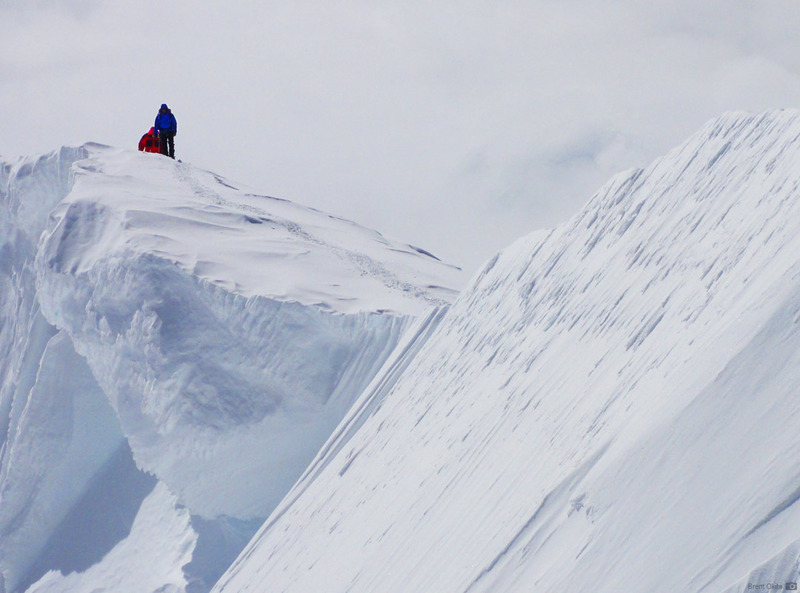 The trip was more than I had hoped for; being alone on Denali with Dave Hahn and the other guides was amazing, being so detached and just surviving. I have been looking for this experience for a long time in all my adventures. 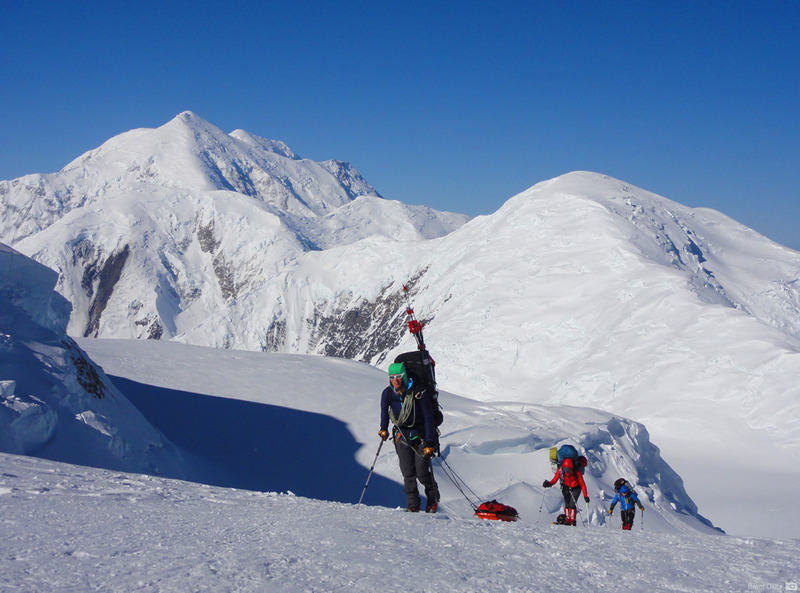 The Alaska range is amazing and this trip was such an amazing trip but I have to say our guides really enhanced this trip. They were their for us and you could tell. They made time and were always including us. They didn't just go into their tents and do there thing. They were always joking around with us and when we were climbing were alway business but in a good way. Ben was our rope lead and was always pointing stuff out to us. He knew we wanted pics so he always made it a point to let us get them. Just a fantastic trip from day 1 to day 26. You guys delivered one of the best experiences of my life. Thank you! 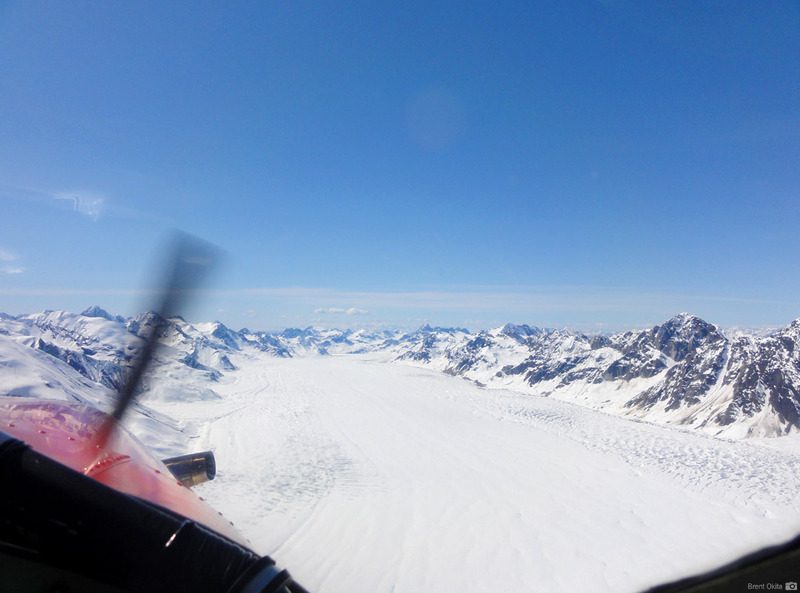 After breakfast we meet at K2 Aviation for the bush plane flight to Kahiltna Base Camp, weather permitting. 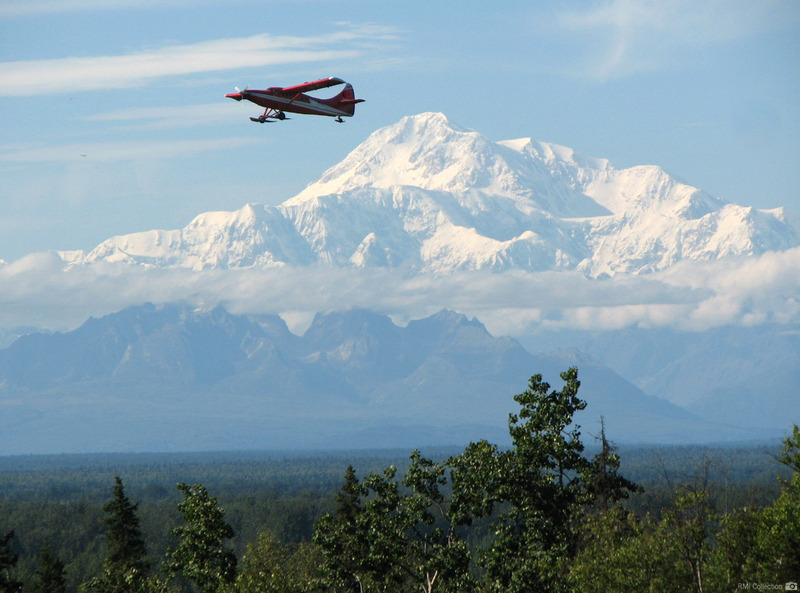 The spectacular scenic flight takes approximately 45 minutes. 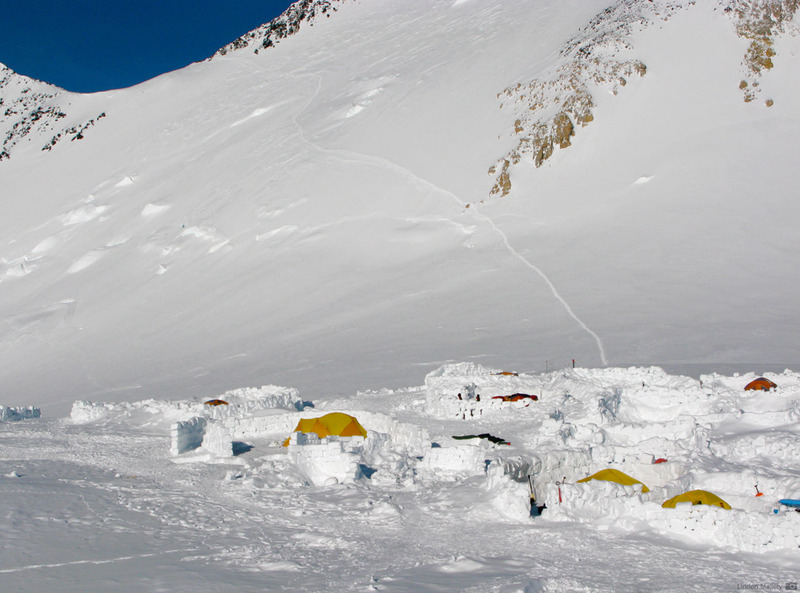 Kahiltna Base Camp lies at 7,300' on the S.E. 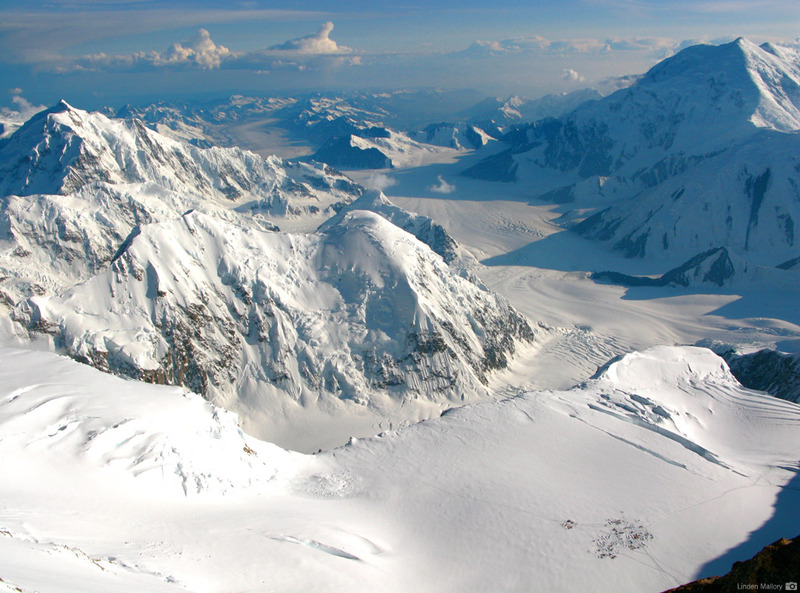 fork of the Kahiltna Glacier, approximately 20 miles distant and 13,000' below the South Peak of Denali, at 20,320'. 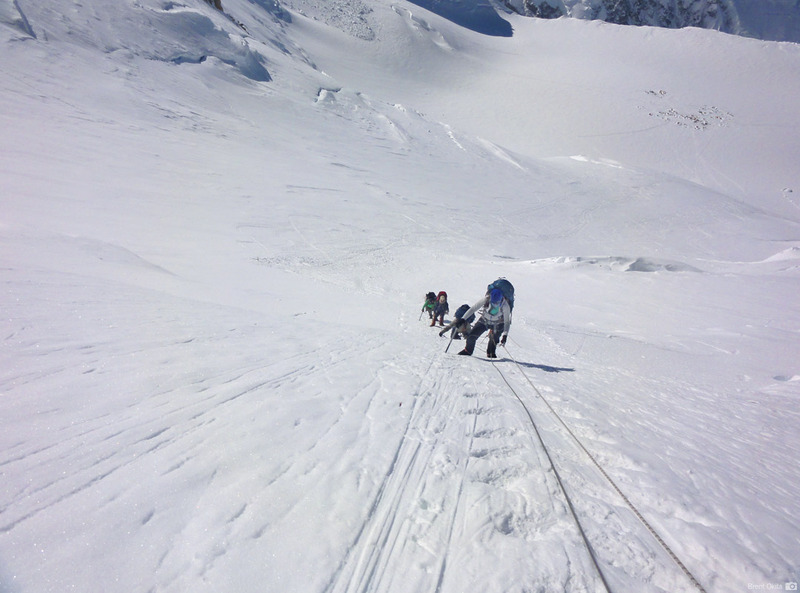 At Base Camp we rig our sleds and review mountaineering skills needed for the climb ahead. We pack each expedition with twenty-two man-days of food. In the event of bad weather, this amount can be stretched several additional days if necessary. Furthermore, there are emergency food rations at Kahiltna Base Camp, in case weather prevents the group from flying off. Ski Hill is the first major elevation gain of the trip. 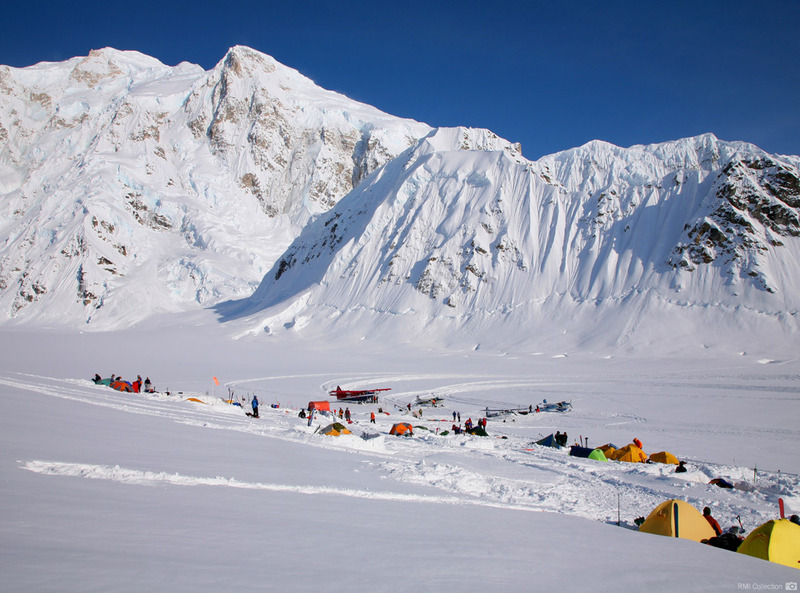 The Kahiltna glacier rises from our camp at the base, towards Kahiltna Pass at 10,000', in a series of rolls. 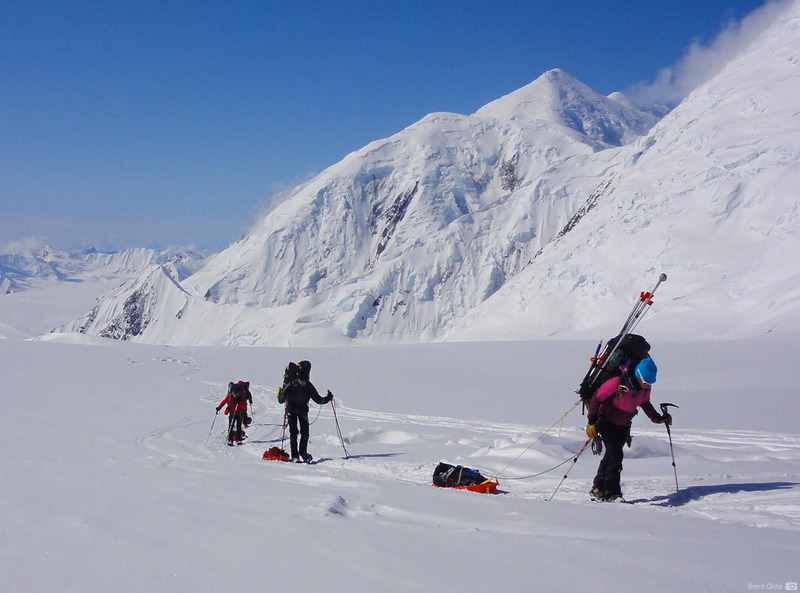 We leave camp, and climb up the glacier to our second camp at 9,600', just below Kahiltna Pass. 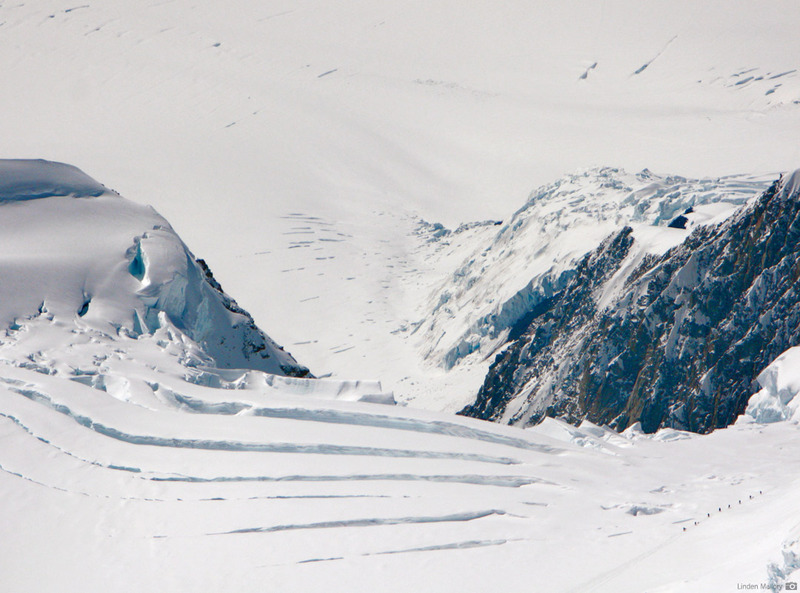 Leaving camp, we climb Motorcycle Hill to a bench with stunning views of the Father and Sons Wall, and the Peters Glacier below. The subsequent climb up Squirrel Hill leads us to the Polo Field, a wide glacial bench at the foot of the West Buttress. 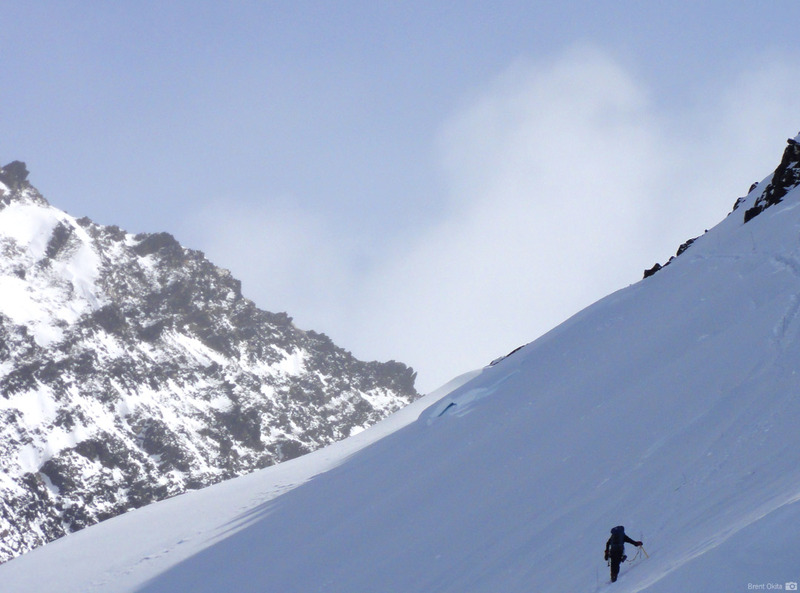 We traverse around Windy Corner at 13,300' to our cache site at 13,500'. 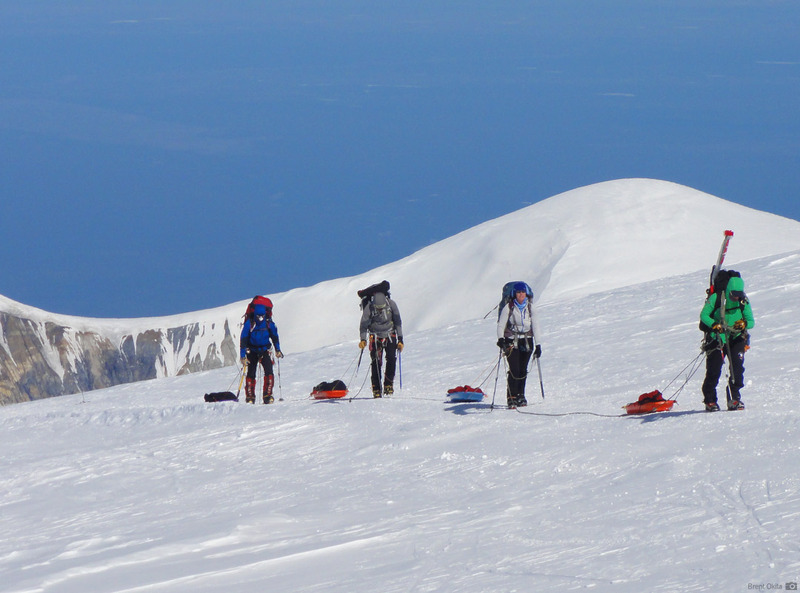 After leaving our load of group food, fuel, and personal items, we descend back to our tents at 11K Camp. After breaking camp we make our move to 14K Camp. 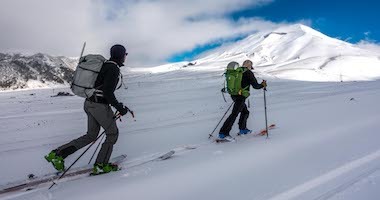 We once again climb around Windy Corner, and passing our cache site, continue to climb to 14,200' Genet Basin, our home for the next several days. 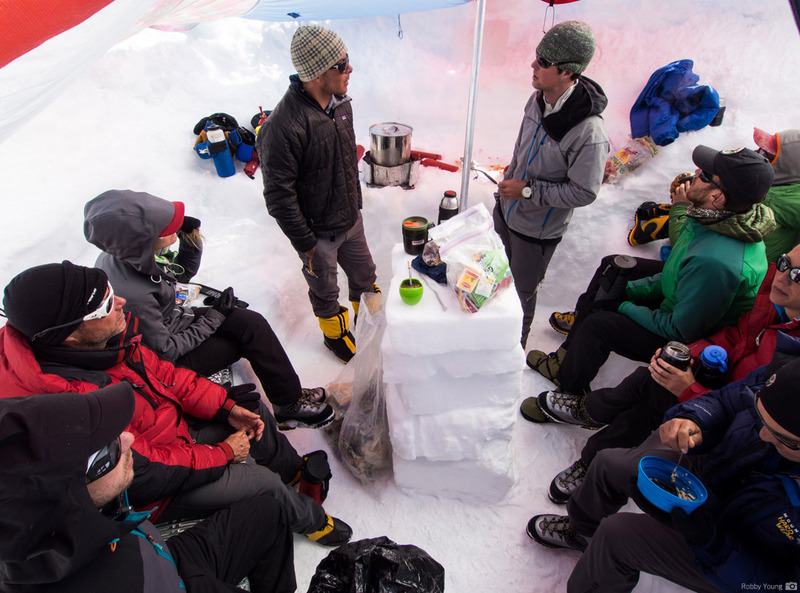 After a leisurely breakfast we make it our priority to hydrate and fuel throughout the day so that we’re prepared for our move to High Camp and the summit push. Depending on weather, we may stretch our legs and take a short walk across Genet Basin to the Edge of the World. From here we can look down almost 7,000' to the N.E. 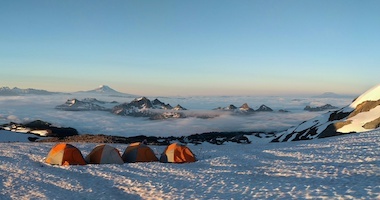 Fork of the Kahiltna, see our first camp at the Base of Ski Hill, and look across the valley to stunning views of 17,402' Mt. 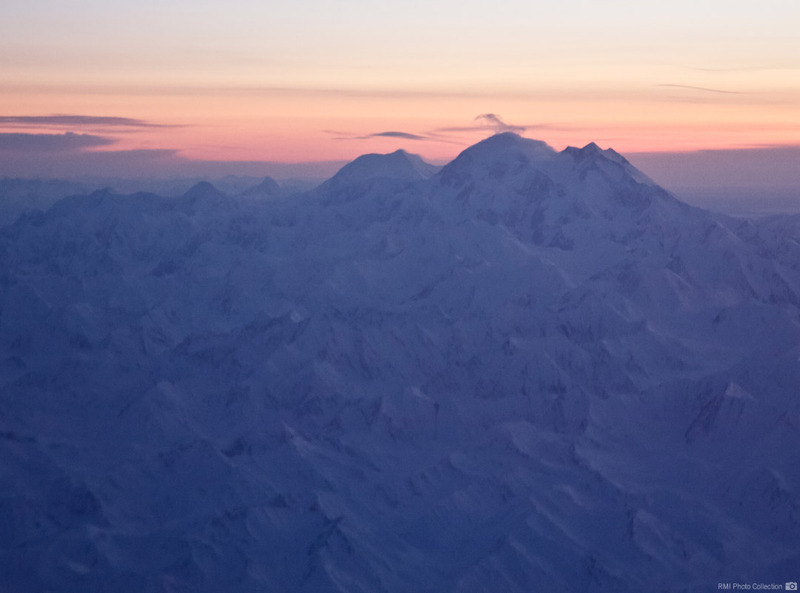 Foraker. 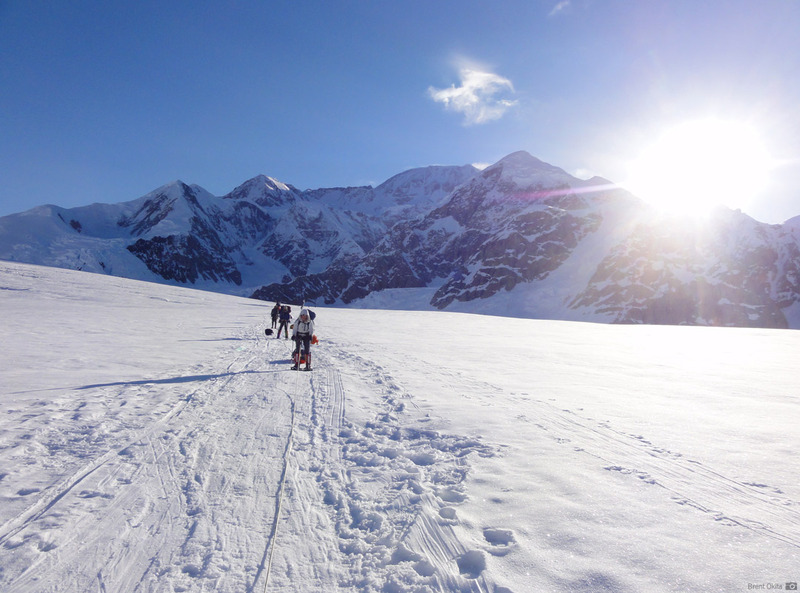 We re-rig our sleds, don our snowshoes, and begin our descent of the main Kahiltna Glacier back to the base of Heartbreak Hill. 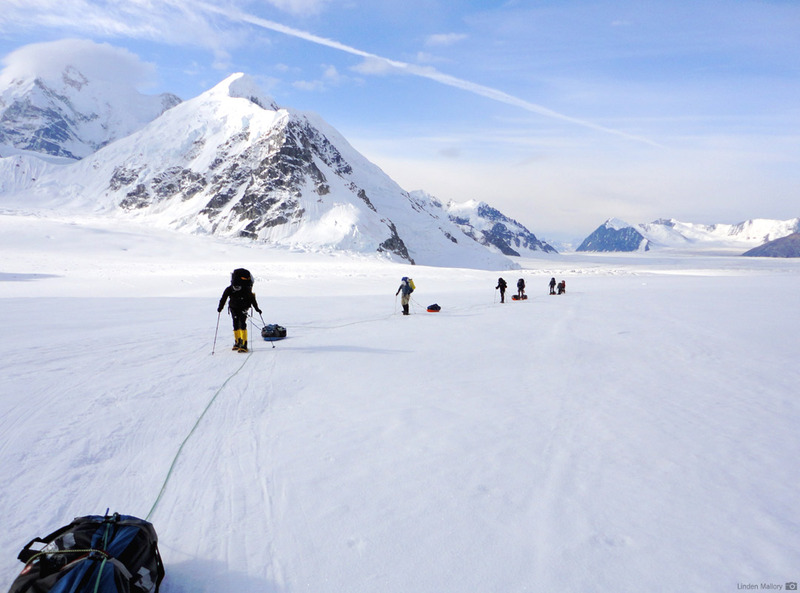 We then turn our sights back uphill to Kahiltna Base on the S.E. Fork of the Kahiltna. $2,500 of the $3,500 deposit per person is non-refundable. Written notification is required for all cancellations. If you cancel 120 or more days before the start of your program, program fees will be refunded less $2,500 per person.